IT WAS a game of inches but when push came to shove, neither Woolgoolga or Sawtell were inch perfect enough to claim victory. 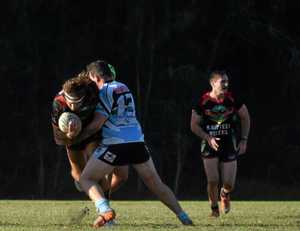 Both teams were left rueing missed opportunities after the 24-all draw played at Woolgoolga Sportsground. "It was disappointing to not get the win," Seahorses' captain-coach Clark Webb said. "Obviously we were in a position where we should've won the game but there were a couple of little errors on our behalf, especially in defence, but at least we got one point." With a little more than 10 minutes remaining, Blake Seymour converted Sukhpal Malhi's second try of the match to give the Seahorses a 24-12 lead but the home team couldn't hang on. Almost immediately the Panthers hit back through Tyran Stevenson before peter Irwin scored for Sawtell in the next set to level the match. Both Lachy Miller and Matt Donovan made field goal attempts in the dying stages but both were unsuccessful before, on the final tackle of the game, Luke Uikelotu made one last attempt at a match winning effort running down the left sideline before a scrambling Woolgoolga defence pushed him into touch. It was a day of close finishes in Group 2 action. South Grafton continued its winning run but only after a late field goal was enough to hold out a gallant Macksville 19-18. Despite playing away Orara Valley was expected to comfortably account for Bellinger Valley-Dorrigo but the somebody forgot to tell the Magpies the script. In the end Orara did collect the two points but only after the home team gave the Axemen an almighty scare. The Axemen cemented their spot oin the top five with a narrow 30-28 win. 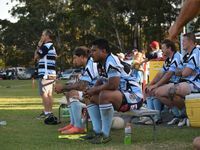 The biggest margin of the round was still an entertaining clash with Nambucca Heads taking it right up to Grafton but the Ghosts proved too strong running out victors 40-24. See Wednesday's Advocate for more details. 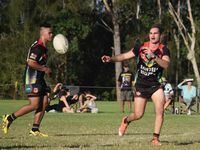 WOOLGOOLGA SEAHORSES 24 (Sukhpal Malhi 2, Reece Hartin, Joel Collinson, Matt Donovan tries; Blake Seymour 2 goals) drew with SAWTELL PANTHERS 24 (Zade Goodenough, Lachy Miller, Nathan Davies, Tyran Stevenson, Peter Irwin tries; Lachy Miller 2 goals).